I've been trying to get back into a little bit of Nail Art lately, including a Rose Nail Art tutorial (broken link removed) over on Cas's blog Serenity of Beauty, as well as a Rainbow Polka Dots Nail Art tutorial (broken link removed) for Marijke at Viva Coco. Please do have a peek and leave a comment if you like what you see - and do check out Cas and Marijke's blogs, they're two very lovely ladies! By the way, I seem to get a lot of questions about my nails (ie, are they real? ), so much so that I have a post over on PVBDaily about how I look after my nails (broken link removed); please do have a read if you'd like to know more! What do you think? Do you like nail art, or do you prefer a plain and simple nail colour? I'll be checking out how you look after your nails...I'm interested as they get to a certain length and start chipping so I get annoyed and file them down! Absolutely LOVE this look though...it's so cute and i loved your rose design too...you make it seem so easy haha! 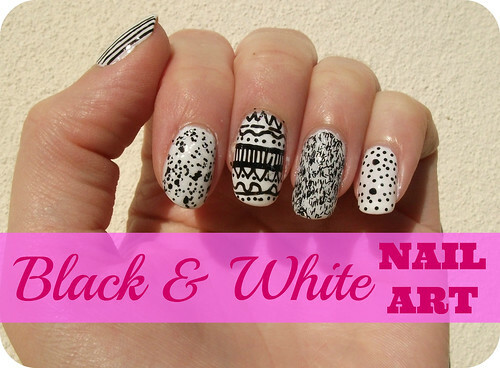 I love this black and white design you have going on :) I'm definitely into nail art, then just having one colored nails. Oh wow I love this :) Bravo chick they look abs fab! 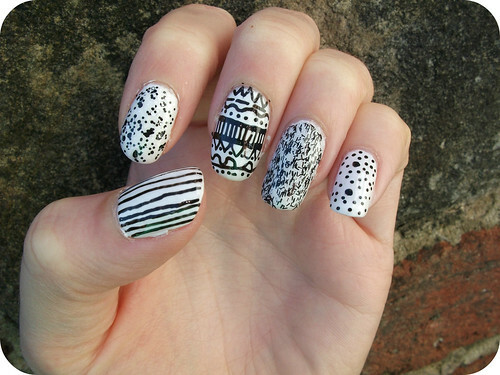 Love these nails, really creative :) I need to get a nail art pen!